Few people can combine fashion while flying, due to those nasty delays, epic layovers and the fact that couture does not usually equal comfort. However, some of the unique travel accessories that are out there aren’t doing people any favours. Here are some of the worst offenders. 1) Whiz Freedom – $20 This plastic funnel has put an end to the one advantage that men have over women in the wilderness. Touted as an ‘easy way to pee freely in cold or cramped environments,’ it allegedly doesn’t spill, drip or splash. That’s great and all, but one is left to wonder…what do you do with it after? My take on this one: only if you were desperate. Like, really, really desperate. 2) Umbrella Hat – $10 Watch out for the fashion police with this gem of an invention. For some unknown yet mind-blowing reason, they were extremely popular when I went to Europe in 2005. They had disappeared by the time I returned in 2011, which I consider proof that there is a God. The umbrella hat is exactly what it sounds like, and promises to keep the sun and rain away. And your dignity. 3) Bucky 40 Blinks sleep mask – $14.50 OK, normally I wouldn’t be one to make fun of a sleep mask as I am ALWAYS the first person to whip one out on a plane, and only take it off for meal service. That being said, I wouldn’t be caught dead in this. Why? Because it looks like you have a bra on your face. Enough said. Is it just me, or does this contraption look suspiciously like an ab roller? The UpRight Sleeper keeps your head pushed up against your seat so you can rest ‘comfortably.’ I think that if you’re desperate enough to be pulling this bad boy out, you’re better off just springing for the business class ticket. I mean, why not just duct tape yourself to the seat? Seems like a cheaper alternative, and you won’t look any less ridiculous. Ah, the Spork. Who doesn’t like a multi-purpose utensil? This spoon/fork combo is meant for campers who hate doing dishes. It’s also perfect for people who just can’t decide what the heck they’d rather eat their chili with. I say, go for it! Just don’t try bringing it on the plane—security doesn’t seem to take kindly to sharp objects. Would you spend money on a ‘privacy shelter?’ Correct me if I’m wrong, but isn’t this just a glorified, tiny tent? The deal here is that you can put a portable toilet or shower in here to prevent trips to the public washrooms. Fair enough, but if you’re SO BUSY while sitting around in the wilderness that you can’t find time for the three minute walk, maybe you shouldn’t be in the great outdoors in the first place. I mean, once you start spending money on all these types of extras, you might as well just spring for a hotel room. 7) Inflatable foot rest – $17 Apparently a lot of people don’t mind hauling stuff around in their carry-on, which is why someone invented this inflatable foot rest. This one blows my mind, because while all of the above seemed to serve at least some sort of purpose, the point behind this escapes me. Can’t you just put your feet on your bag? Or God forbid…the floor? 8) A rm weights– $25 Ah, the invention for people who want Michelle Obama arms without ever going to the gym. Wrap these suckers on your forearms, and wear your workout wherever you go! The bonus? They can be worn discreetly under your sleeves. The downfall? Umm…that the chances of these doing anything for your figure are slim to none. Just go to the gym already, lazy bones. 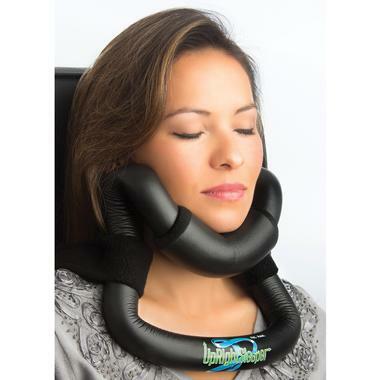 9) Skyrest Travel Pillow – $30 For the record, I truly hope that one day, someone whips this beauty out beside me mid-flight. Why? Because I will be so busy laughing at them, I won’t have to bother with the in-flight entertainment. Has anyone ever actually bought this? Sure, this ‘very flexible’ pillow is ‘easy to pack,’ but I doubt your seat mate will appreciate you huffing and puffing all over them as you try to blow it up. Pass! I had to save the best for last. And have nothing more to add. This picture says it all. Click here for a list of the travel accessories I would actually recommend. Another post that got us giggling. You have great writing flair! PS We too would love to see someone pull out Number 9 to use next to us on the plane. Brilliant, I love them all. Would love to see people wearing those umbrella hats next summer. Absolutely brilliant, though I would say a spork personally is a camping essential, all you need. SPORK. Haha thank you George, this was for sure one of my favourite articles of all time to write- I couldn’t stop laughing! I may need to do a sequel. It’s funny you mention the spork: my husband and I are currently in Colombia and he was saying we should have brought one as we were wandering through a supermarket! Having considered fashioning my own funnel and peeing into a bottle under a blanket on yet another 12 hour bathroom-less South American bus recently, I can truly say that I would unabashedly use #1! Considering buying one right now!! This made me laugh,but I have to admit to loving my shaped eye mask and I’m considering buying a footrest. I have the former because I was blessed with naturally super long and curly lashes and the regular kind of eye mask is just not tolerable for me. I’m considering the footrest because my choice of carry on is a tote bag and not sturdy enough to rest my feet on without damaging the contents and on long haul my legs ache if not elevated. So those are my excuses, but I also have no shame so I’m not too worried about what those travellers roughing it think of me ? Kara, I have a confession- I totally ended up buying the eye mask too! Haha! I agree with most of these. BUT as someone who is barely 5 feet tall on a good day, the inflatable footrest is a godsend on those long flights!! What a great laugh! Especially #10, it peeked my curiosity and yes,,,, I had to click the link to see more pictures and watch a video of the ‘Ostrich Head Pillow’. 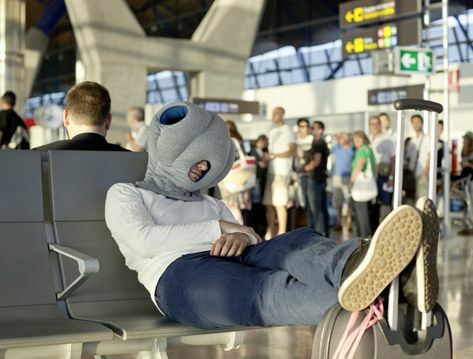 I can just imagine the boss walking into the office while the guy is snoring with that thing on his head, lmao! The privacy tent does have it’s place also though. My RV has an indoor shower, and a compartment on the back that reveals an outdoor hand held shower, with no walls. When I have a family reunion camping weekend with 20 or more people who don’t want to put coins in at the paid showers and spend ten bucks, that tent sure comes in handy. I will confess I likely wouldn’t pay $120, but $50 second hand sure works!